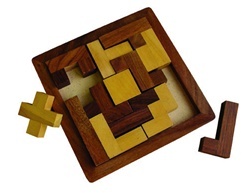 This impressive puzzle is made by a group of artisans in rural India who are committed to quality. Each piece is hand-crafted, and the game is more challenging than it looks! It offers you and your family many hours of puzzling. Comes in a drawstring cloth gift bag. I bought this for my husband for a Christmas stocking stuffer and we have all really enjoyed this puzzle. Beautifully hand crafted, it looks wonderful on our coffee table and lends to entertaining our children of all ages in so many ways. They love trying to put the puzzle together (there is more than one solution, we found out), and even sometimes use the pieces to build a little village! Received this one as a gift. It is very well-made, as previously commented, and looks great enough to leave out on purpose. It does come with the completed picture printout, which we recommend scanning to have a digital copy just in case. Our kids love puzzles and brain teasers but most of the ones we buy break very quickly or the puzzle pieces bend and get worn out. Not this one! It is quality, sturdy wood and tons of fun. We even busted it out today for hours of fun to see who could get it done the quickest. It's tough so it's nice that it comes with a picture of the completed puzzle in case the little ones need help.